Although we don't realise it, one of the most dangerous driving times of the year is the early summer in the UK. Strong sunlight in the morning, weekend barbecues and the consumption of alcohol. But equally concerning is the impact which hayfever has on driving. Malcolm McNeill takes a look at the potential problems. Hay fever is an allergic reaction to pollen or dust mites which impacts 11 million UK motorists each year. During the early part of summer the pollen is more prevalent due to the large number of flowering plants and grasses. For a lot of people the symptoms are relatively minor, similar to the common cold, streaming eyes, running nose and persistent sneezing; but in some cases it can be quite incapacitating, banishing some people to remain indoors until the danger passes. There are 2 ways in which hay fever can affect your driving. The first is the most obvious. When hay fever strikes, most people have an allergic reaction by having a sneezing fit. Try keeping control of your vehicle at 70 mph in the fast lane, it can be very frightening. Most modern vehicles have anti-pollen filters fitted to the air conditioning or air intake system, but these need to be replaced regularly. The second is the impact which some of the hay fever cures can have. Although it is possible to buy non-drowsy versions, the stronger concoctions can make you feel sleepy and completely prevent you from driving safely. Warnings are plastered all over the labels to avoid such scenarios. 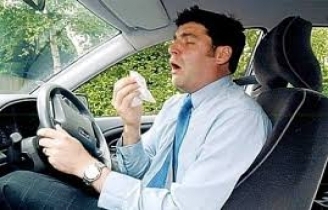 According to research conducted by eSure car insurance more than 2 million UK motorists may have had an accident, near miss or momentary lost control as a result of sneezing while driving. eSure has compiled a list of suggestions to help get you through the hay fever season. Carefully check the medication label to ensure it is non-drowsy before getting behind the wheel. Keep windows closed while driving as car pollution increases the hay fever symptoms. Avoid going outdoors in early evening as that is when the pollen count is at its highest. Check vehicle ventilation for clean air filter. Check air conditioning and pollen filter. Vacuum and clean indie of car to keep dust particles down. Use non-sedative antihistamines and nasal steroid sprays early in the hay fever season. Avoid having pets in the car. There numerous anti-histamine products on the market. You can buy these at your local pharmacy but you must follow the package directions. Antihistamines do not stop or cure the allergy, but they do help control the symptoms. Remember to consult your doctor if you are taking other medicines. You can try decongestants which are available as both a pill and nasal spray. Last but not least there are various herbal remedies but again great car should be taken to avoid any adverse reaction. Good advice not to be sneezed at! Also try our new Motor home rental site HolidayCampervan.com.